Meet Syed Balkhi, the man behind WPBeginner, a site dedicated to helping new WordPress users troubleshoot problems, get answers, and learn how to walk in the ways of WordPress. How did you start using WordPress? I started using WordPress back in 2006 when I found a need to add a blog to one of the websites I used to run. I ended up customizing the design’s look and feel. Next thing you know, I was setting up, designing, and customizing WordPress sites for friends, family, and clients. Tell me about WP Beginner. How did you get started with it and what’s your mission? In late 2008, I decided to exclusively build WordPress sites, and I also decided to move our existing retainer clients over to WordPress for a one-time fee. The benefit to them was that they would not have to pay me a retainer fee to edit text on their HTML pages. WordPress allowed them to do that on their own. In early 2009, I found myself in a very odd situation. I was receiving the same support questions from multiple clients. How do I do this? How do I do that? I have had my fair share of frustrations with learning WordPress, but I was much more technically-inclined than others. I noticed that most sites in the WordPress industry at the time were by developers for developers. There were other “training sites” for beginners, but they were charging upwards of $400 for a training session. I talked to a few of my developer friends and asked for resource suggestions, and they had none. They’d built a custom FAQ list for their clients, or offered PDF guides. I knew that a site like WPBeginner would do very well for our customers, but also for the larger community. The mission behind WPBeginner is to offer new users and non-technical users a free resource that I wish I had when starting out. A resource which provides step-by-step guide on how to make the most out of your WordPress site. What has running WPBeginner taught you? Running WPBeginner is a humbling experience. The single most important lesson that I have learned from running the site is that you can never know enough. There is always more to learn, whether it’s about a cool new function, or a neat new plugin. WordPress is powering millions of websites running on various different server environments using different plugin combinations. The amount of new things that you get to learn from troubleshooting is just amazing. Another lesson that I have learned is that helping people unconditionally goes a long way. I helped one user out, and he turned out to be a CEO of a very popular company. By having a small conversation with one of our users, I ended up inspiring him to create his own business. Through WPBeginner, I have had the pleasure of meeting some of the most amazing folks. Even though they’re learning WordPress, they are very good at what they do. One such connection helped me get invited to the Summit Series where I got to meet and learn from guys like Richard Branson, Russell Simmons, Gary Vaynerchuk, Tim Ferriss, and others. As someone who’s experienced in WordPress and in writing for WordPress beginners, what is the most important piece of advice that you can give to those diving into WordPress for the first time? The most important piece of advice I give to new users is that WordPress has a welcoming community. To get help, all you have to do is ask. Whether you ask by sending us an email, tweeting us @wpbeginner, or posting a question in the WordPress.org forums, you will get help. I highly recommend that all new users check to see if there is a WordPress meetup in their city or in a nearby area. Lastly, I recommend that they start following respected developers on twitter. I have created a list of some folks that I regularly follow. What’s the most frequently asked user question at WPBeginner? Another question that we receive on a regular basis is “Can I install WordPress on my computer?” This comes from beginners who do not understand the concept of web hosting and domain names. However, on occasion it comes from beginning theme developers or folks who just want to learn. Another common question that we get is “I’m locked out of wp-admin, and my website shows an error or a blank screen.” This usually happens when the user pastes a code snippet from a website into their functions.php file using the admin panel. A lot of these users do not know how to use FTP either. Here’s our list of the top 15 most-asked questions by WPBeginner users. How do you give back to the WordPress community? Most of our articles are user-suggested questions that we end up answering and converting into articles. WPBeginner is free from the ground up, and we have no plans to charge for tutorials. We help dozens of users daily through our contact form answering questions and helping them out. We have hundreds of thousands of users who use WPBeginner articles on a regular basis. 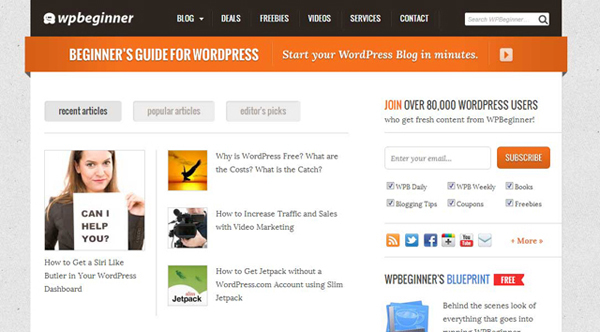 Some of our users have gone ahead and created their own WordPress design and development firms. Over the past three years, I have had a chance to meet numerous WPBeginner users who have come and personally thanked me for helping with their business. I attend anywhere from six – 10 WordCamps a year where I volunteer my time in the Happiness Bar and answering questions that attendees have.